“My style is often a series of things that, theoretically, don’t match, but are fun to me nonetheless. I enjoy challenging norms with proportion play. It’s also a mix of masculine and feminine elements. Here I’m wearing a Dries Van Noten coat, Calvin Klein (205W39) sweater, a pair of men’s Ann Demeulemeester pants that I washed and dried several times to shrink to fit, and Prada shoes. For me, ease of wear is everything. I enjoy intricate garments that highlight a level of technique or craftsmanship (for example, the jacquard weave of my Dries Van Noten coat) but at the end of the day they also wear simply and can be paired just as easily with heels as a pair of Vans. Utilitarian with a twist, in a way. It’s not shocking Julie’s style is easily coveted. She’s a rad stylist with a great eye and interpretation of fashion. Absolument d’accord,et si je ne vous avais pas lue,j’aurais ete plus virulente dans mes commentaires. C’est exactement ce que j’étais en train de me dire quand j’ai lu la liste des marques “bon marché” (légère ironie) de ses vêtements. Ca serait effectivement intéressant de voir quelqu’un porter des vêtements venant d’une marque low cost comme s’il s’agissait de vêtements de créateurs. Juste une (autre) idée. beautiful photo (love the classical composition) of fabulous style! 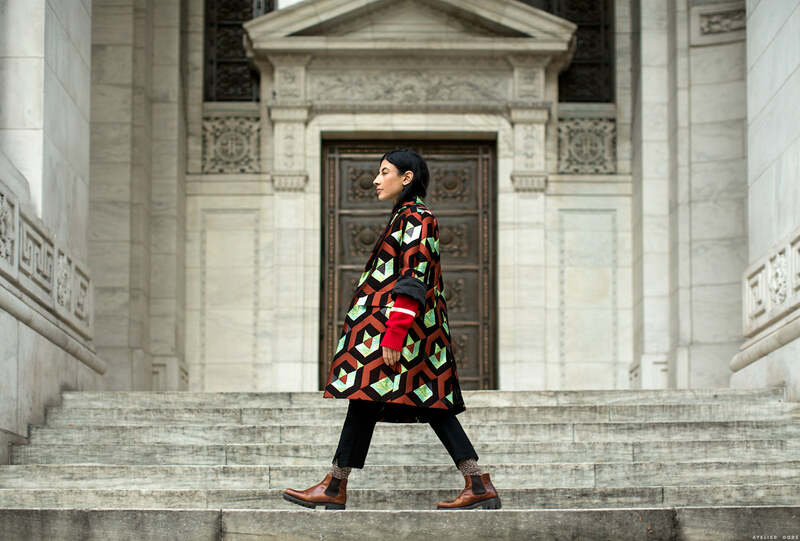 Inspired by how she mixes and makes very strong pieces her own — that Dries coat, for example. And, in essence, diy-s the Demuelemeester men’s trousers to fit her! Exceptional personal style at work — great to see, thank you! At first I thought it was Marina Abramovic! I challenge fashions norms and rules always . The best style comes from knowing yourself . Julia looks so relaxed and alive in her style. J’adore le graphisme de la veste.